Mr. Morelli was appointed Chief Executive Officer and General Manager of Banca Monte dei Paschi di Siena S.p.A. on 20 September 2016 following his co-option by the Board of Directors. From October 2012 to September 2016, he was Vice Chairman of Bank of America Merrill Lynch for Europe, the Middle East and Africa and CEO of Bank of America Merrill Lynch Italia. 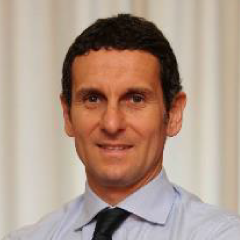 Between March 2010 and 2012 he served as Deputy General Manager and Deputy CEO of the Intesa Sanpaolo Group. He previously held a number of senior management roles within the Montepaschi Group, first as Chief Executive Officer of MPS Capital Services S.p.A. and later as Deputy General Manager of Banca Monte dei Paschi di Siena S.p.A from June 2006 to February 2010. Before joining the MPS Group, Mr. Morelli was Chief Executive Officer and General Manager of JP Morgan Italia and a member of JP Morgan Europe’s Executive Committee. Previously, he had worked for UBS, Samuel Montagu and KPMG in various locations across Europe. Throughout his career he has also been a Director and Member of the Executive Committee of the Italian Banking Association and a Member of the Board of Directors of Fondi Italiani per le infrastrutture (F2i), the Luiss University of Rome, Banca IMI S.p.A., Beni Stabili S.p.A. and Clessidra Private Equity Fund. Mr. Morelli is also a Founding Partner and Deputy Chairman of the Executive Committee of the Don Gino Rigoldi Foundation – Onlus and is a Lecturer of Economic & Finance and Business Management at Luiss University, Rome. He holds a degree in Economics and Business Studies from Luiss University and is also a qualified Chartered Accountant and Auditor.